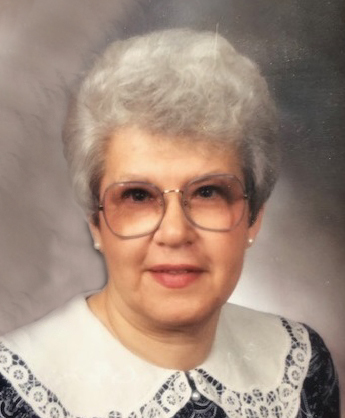 Barbara Ann Engel, 85, of Traer, passed away of April 4, 2019, at Sunrise Hill Care Center in Traer. Barb was born on October 1, 1933, on the family farm south of Traer, the daughter of Charlie and Anna (Suchy) Hanus. She attended country school and graduated from Traer High School with the class of 1952. After graduation, Barb worked at the Traer bakery, Traer Municipal Utilities, and various banks in Traer, Clutier, and Waterloo, before retiring. Barb was united in marriage to Robert Engel on November 21, 1964, at St. Paul Catholic Church in Traer. Barb was a member of the Catholic church, the Legion Auxiliary, the Iowana Club, and the Red Hat Society. She enjoyed gardening, flowers, shopping, baking birthday cakes, watching sporting events, dancing, and spending time with her family and friends. Barb in survived by her husband of 54 years, Robert of Traer; two children, Mary Jo Engel of Traer and Thomas (Lisa) Engel of Grimes; a brother, Vernon (Dorothy) Hanus of Traer; five grandchildren, Landon, Peyton, Madison, Charlie, and Chase; and nieces and nephews. She was preceded in death by her parents; a sister, Marian (Hanus) Schoonover; and a brother-in-law, Harold Schoonover. Barb’s family wishes to extend their sincere thank you to the staff at Sunrise Hill Care Center for their love and care over the years. Memorial gifts may be directed to Sunrise Hill, 909 6th Street, Traer, Iowa 50675.